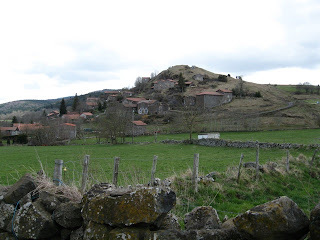 An illustrated account of my walk from Le-Puy-en-Velay to Santiago in 2008. 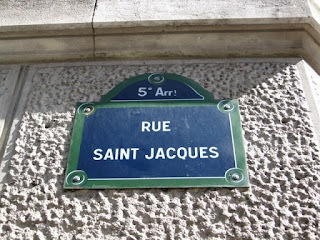 From mid-April until early July 2008, I walked the way of St James. 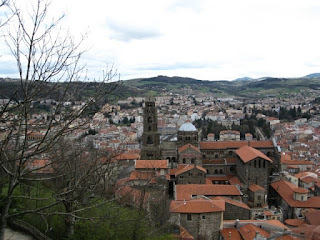 I began in Le-Puy-en-Velay in France, and finished in Santiago de Compostela in Spain, nearly three months later. By the time I finished it was clearly summer, though fortunately for me as a walker, not as hot as it can get in northern Spain. When I began, I was surrounded by others mostly walking for one or two weeks during their vacation, but gradually I met more who were intending to go further. At this stage of the journey though, people tended to be very humble about their chances of going 'all the way' to "St Jacques". People would always add "si on peut...' (if I am able...) to their response. At the beginning it often seemed to me that I was the 'slowest' walker around. But the French had what I found to be two very helpful attitudes to walking. They would often say - "each one has their own rhythm". 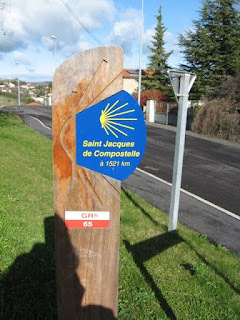 And with respect to long distance walking, I heard repeatedly..."Il faut aller doucement, doucement, pour aller a St Jacques." - It is necessary to go gently, gently to get to St James. 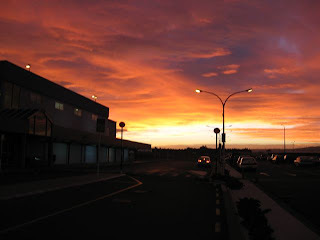 First step was a domestic flight away from my home town, and there was a glorious sunrise at Palmerston North airport for my departure. As we approached the urban sprawl of Auckland, fingers of mangroves poked out in the harbour. It wasn't long before I was on my SQ flight and flying internationally, with glorious daytime views over the vast dry of central Australia. All these brought promises of the outdoors I was soon to be immersed in. involved in a love affair with a rampant spring. tombs of Kings Queens princesses. 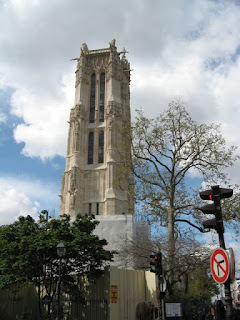 Near Notre Dame, St Jacques tower stood against the sky in the spring sunshine. I stood there thinking of all those who had walked before me on this route. 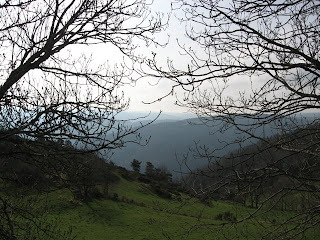 buried deep in the Auvergne. my first challenge as a pilgrim. penance already before the real walking begins! not just an immersion in death. 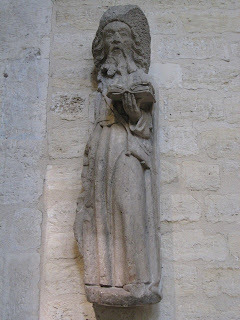 St Jacques statue bathed in welcoming light. was surrounded by red lamps. but here, light permeated from behind, allowing peace. and left a prayer for another pilgrim to carry. orange roofs against green vegetation. in the Cathedral where the Virgin resides. 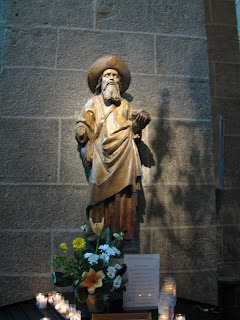 the first time I was recognised as a pilgrim,"Bonne Courage! Bonne Route!" 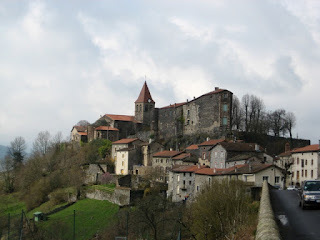 2012: I arrived in Le Puy this time early in May at the end of a walk from Cluny- a challenging, solitary journey. My French friend had recommended that I stay at the Gîte Relais du Pèlerin Saint Jacques, and they were incredibly welcoming there. 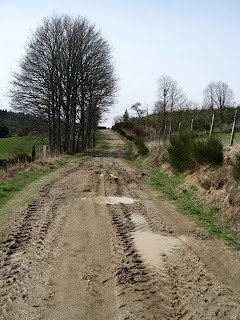 When I reached Le Puy I lost the chemin I had been following- after just over two weeks of keeping my eyes peeled for small coquille markers. 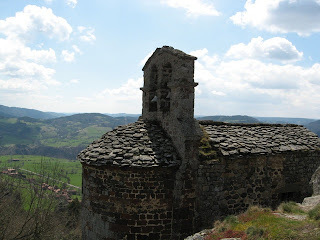 I had had to be 'strong' by myself on the Cluny route, but I 'lost it' once in the sanctuary of the crowds in Le Puy. 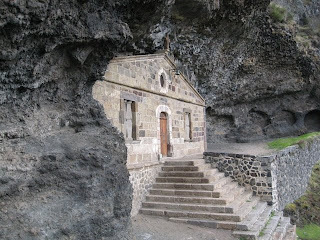 I found this little chapel near where you climb up the 'needle'. 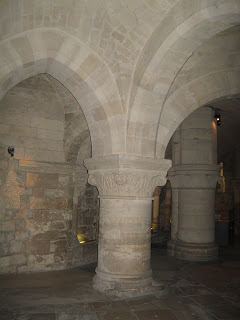 Luckily, for several minutes, no tourists came in while I cried, and the one person who then did come in was a pilgrim who had just finished walking five weeks. He understood! and a prayer to carry on behalf of another.I still felt so very uncertain of myself, even as a walker. How would I manage for days and days with a pack on my back? 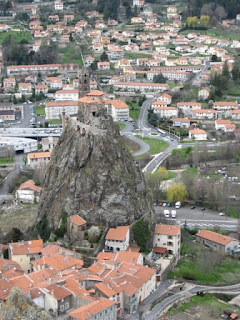 climbing out of Le Puy to the higher ground above? it had largely levelled off. My "fitness" walks all summer had paid off. a sense of 'rightness' in what I was doing. I would have the joy to be immersed in the outdoors for many days ahead. where life was already being lived 'in the present moment'. that I would end up seeing often over the next few days. all enjoying the sunshine, despite the chilly wind. The climb seemed gradual, not too hard. so that walking four km seemed to take forever. 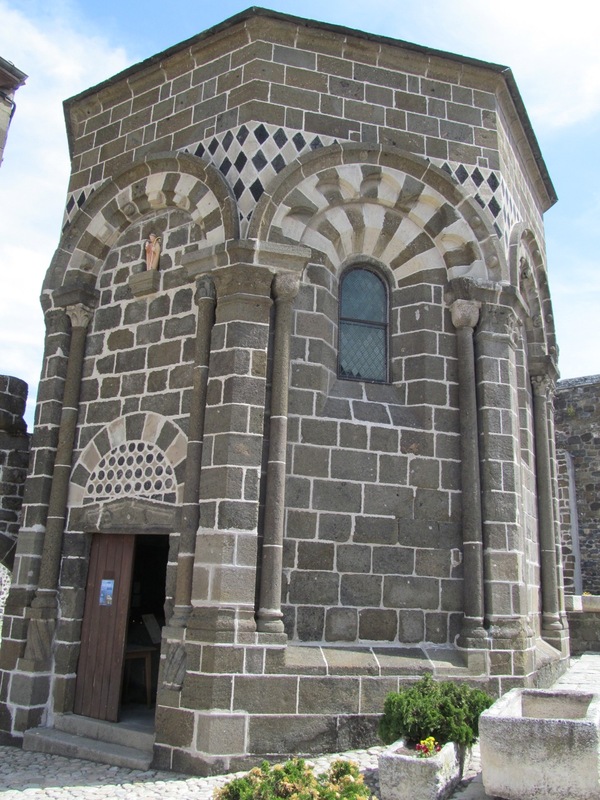 with its houses made of stern volcanic rocks. 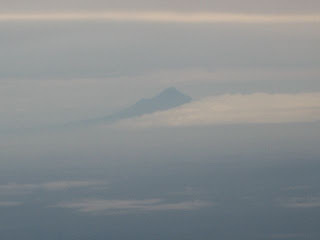 The challenge of walking alone in such terrain was with me. then it was back to sunshine. a novelty for me, but not for most of the French. no wonder it had got colder! and the shared meal of demi-pension. 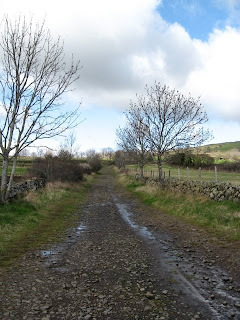 2012: I wasn't sure how I was going to find it, 're-walking' some of my 2008 route. I knew it could never be the same as that first time as a newbie pilgrim, my heart full of hopes, fear, joy, with unknown challenges ahead. But I was soon to discover, it was still a new thing. 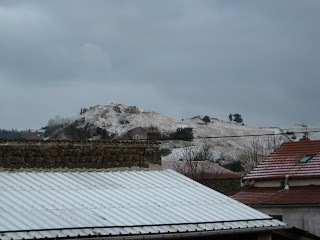 Each day I met new people, stayed in some different gîtes/villages from before, and saw places in different weather, and in France at least, slightly later in the season. 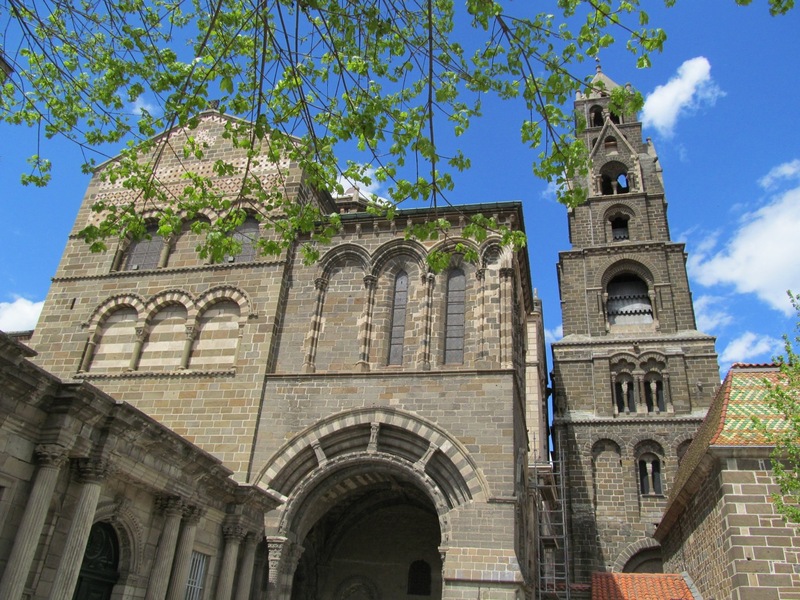 This time, I knew to make sure I took lunch with me from Le Puy, and actually had something to eat when I reached the seats behind the romanesque church at St Christophe sur-Dolaison. The weather began to change, and clearly a storm was imminent. 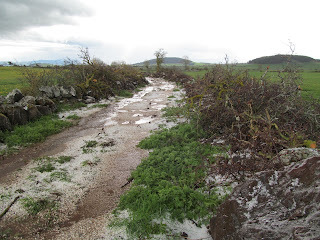 About 5-6 kilometres from Montbonnet, while I was walking amongst the lentil fields, the storm struck, and I was walking in thunder, lightning, and was under bombardment from heavy hail. There was no shelter, and I was concerned that the hail was so hard, I might even suffer a head injury! The track became like a stream. This was the same area where I had struck sleet/snow on my 2008 walk from Le Puy: lentils thrive in the harsh weather it would seem! 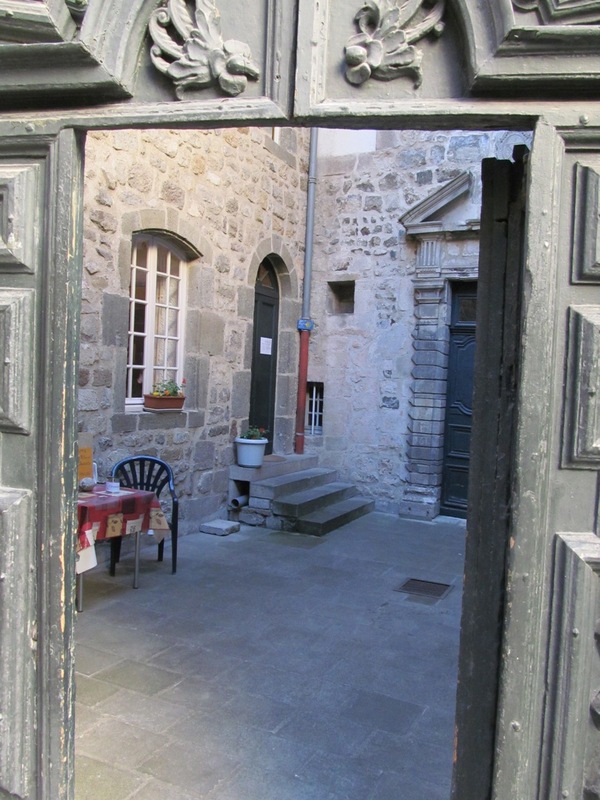 I had found it very hard leaving Le Puy in the morning this time, saying goodbye to some special friends, but it was like God was having his own special joke at my expense here, making the 'present moment' so intense I had to live in it, and not worry about anything else! 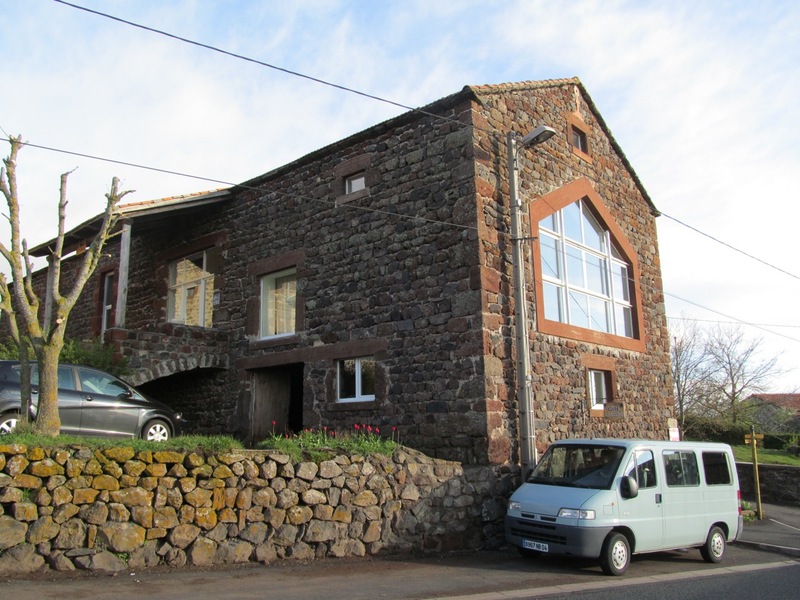 In 2008 I had enjoyed staying my first pilgrim night in l'Escole gîte in Montbonnet, and was disappointed to find it was 'complet' this time. However, a real treat was in store instead. 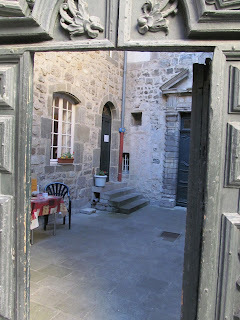 'La Grange' gîte, next to the bar, was in an old stone building that had been completely modernised inside. It had a huge communal lounge with windows that had a view absolutely to die for, with so many old volcanic remnants in the landscape. I would quite happily have stopped walking here for another day or two just to sit in this lounge and contemplate the view! And like always on a pilgrim walk, once wet clothes were peeled off, and I was showered and in dry clothes, the world was made new again. I headed back to the bar next door for a welcome hot chocolate. 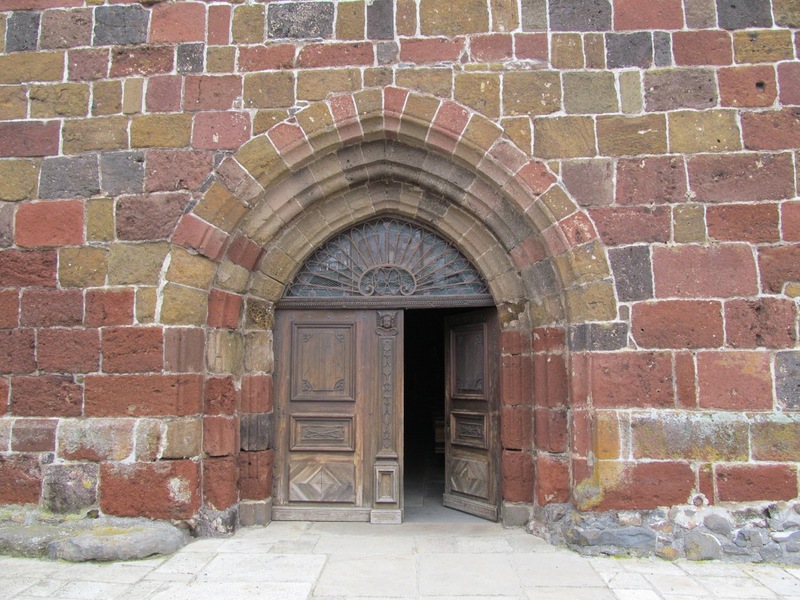 Romanesque, its arches hewed from volcanic rocks. as I listened to the bells tinkling on the sheep nearby. telling a story of simplicity to the present. resting place for the second night. 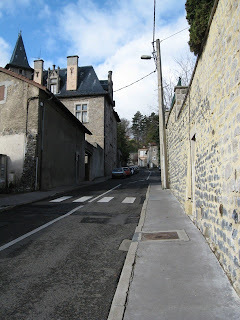 2012: I remembered feeling quite exhausted last time when I arrived in Monistrol d'Allier, and put it down to my newbie-ness. 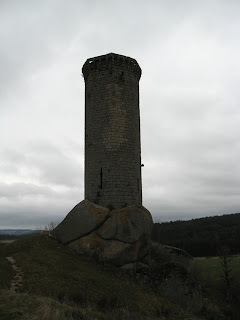 But I realised today that some parts were harder than I remembered- especially the descent from the little chapel of Rochegude, which had large rocks to clamber down, tricky for one with shortish legs. There was ample reason for my exhaustion! 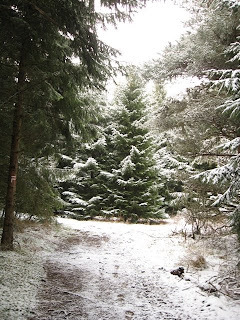 And yet I had remembered the snow that I had walked through in the forest near Montbonnet in clear detail. 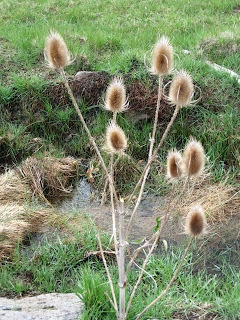 I was to discover how often my brain had done this: I remembered the weather I had encountered in certain places, but did not always have a good recollection of how difficult the terrain might have been. 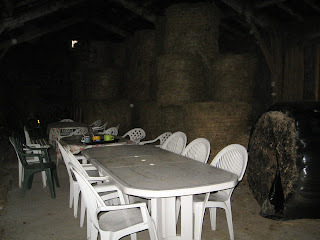 I enjoyed the evening in the Gîte Tsabone very much. 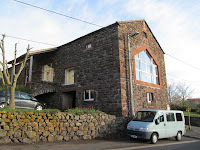 I had stayed here in 2008 also, but now it is run by a different young couple, and they were very welcoming. I met Brigitte and Christine here, two French cousins, and our paths were to cross often over the coming week. but in the end I found again that my fitness training counted. ...she was of mountain stock and I was holding her up. She left me with encouraging words about each of us having our own rhythm. and the walk became easy. and my heart rejoiced as always with the views. with farmland that reminded me of home. though I think the dragon-woman at the restaurant I reached for lunch was a bit shocked by my appearance! 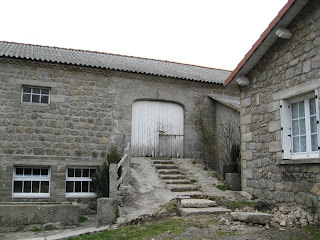 a gite "a la ferme", aka the Martin's place. and when I went to the church that evening to get my credential stamped they already knew about the lady from New Zealand. 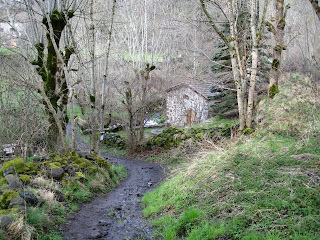 "Radio Camino" worked well in France! 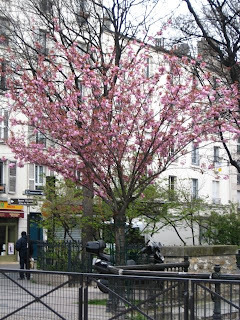 whatever spring blossoms were evident in Paris. 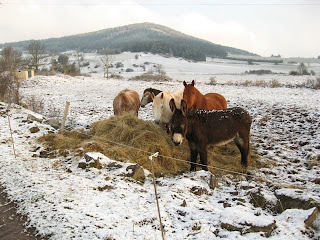 and all made cheerful comments on the cold day we were sharing. I bundled myself up warmly in multiple layers! 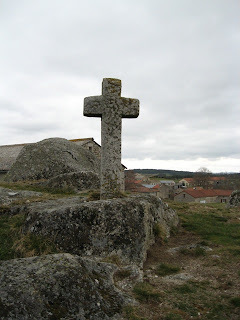 This region of the Haute-Loire has many crosses in the landscape. that people were praying for those who passed by. 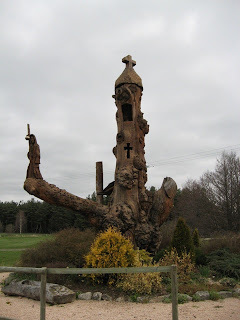 But later I think I learned that they were in fact a means of warding off evil ones from the villages we were passing through. looked sturdy against the elements. who were walking similar stages to me. There was a group of four ladies from St Etienne. and made sure someone was speaking slowly enough for me at the dinner table. as we sat outside all bundled up against the cold while we ate. (I haven't managed to make contact with these ladies to share my photos: if anyone reading this recognises them, I would be glad if you could tell them of my blog...) And there was a family from Anjou, two parents and two of their four children, a daughter in her early 20s and a son who was about 8. 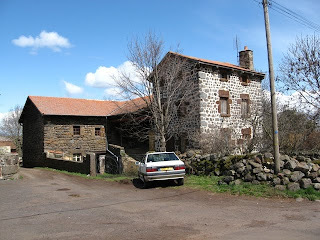 I ended up staying in the same town/gite as them several times. This evening in Chanaleilles was perhaps the most special. 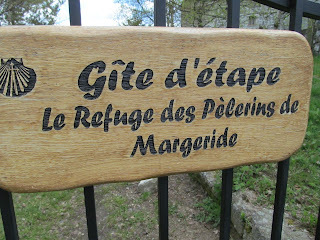 We were staying in a gite a little way off the GR so there were not so many pilgrims. We arrived on this bitterly cold afternoon and the first thing that Mme Richard, the gite owner, did, was light the fire, which gave very quick and welcome warmth. Sitting in the comfortable lounge sharing some quiet time with this family, I felt very much 'at home'. 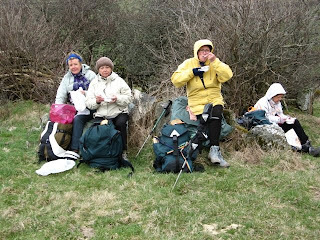 At dinnertime we had to brave the elements to walk the short distance to the bar, but what a delicious meal. We had soup, perfect for such a cold day; then salad, with greens that the husband had collected freshly from the mountains that day. It was a lamb dish for a main. Great company and an excellent meal to give energy for the challenges of the next day. 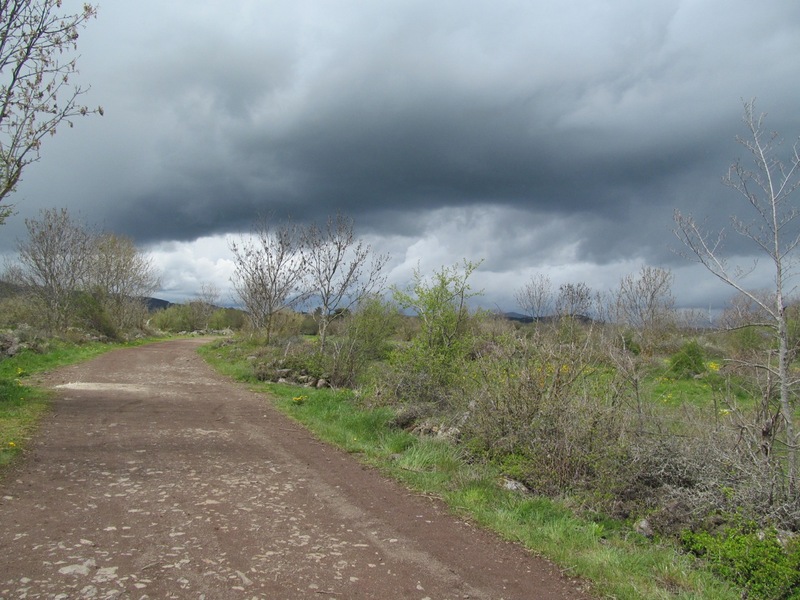 Chanaleilles was only about a kilometre off the main track, and I am glad I stayed there. 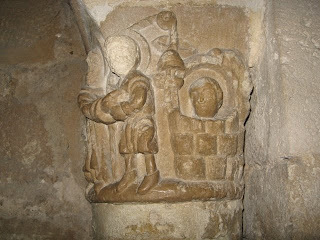 The cold weather limited exploration, but I saw the church, beautiful Romanesque with a distinctive belltower, and a medieval statue of the Virgin inside. 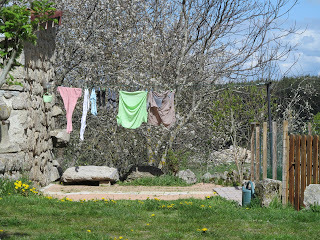 And the gite was one of those very welcoming ones, pleasantly common in France, where the welcome in the afternoon gives renewed strength for the next day of walking. 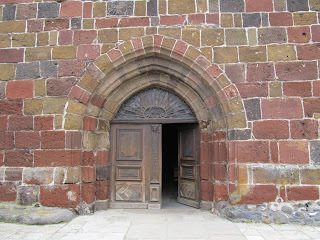 2012: This time I was already well 'walked in' and never stopped at Saugues, but continued on to La Clauze. 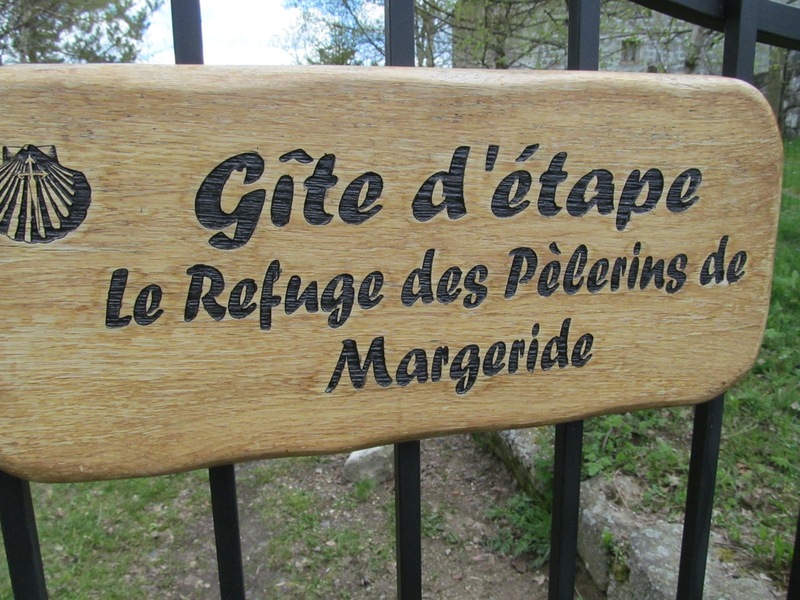 There are two rural gites there and I stopped at the gite des pelerins de Margeride. 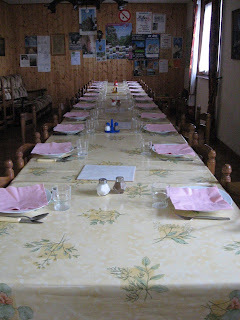 It was just lovely- very welcoming couple, and very much enjoyed the shared evening meal in their company. It cooled off in the evening- and they had a warming fire by the dining table. 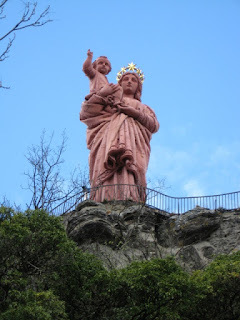 When I was preparing to walk the route from Le-Puy-en-Velay to SJPP, I found there wasn't much info in English, and I hope this blog might fill the gap a little.... 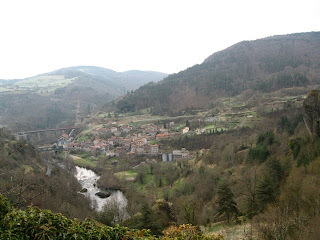 In 2008 I walked from Le Puy to Santiago. 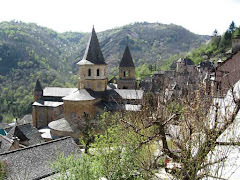 In 2012 I walked from Cluny to Conques, then spent three weeks in Spain, re-walking two sections of the Camino Frances. Please feel free to contact me if you wish. Day 83: 5 July- Monte de Gozo to Santiago! Appendix 4: Where did the idea come from? 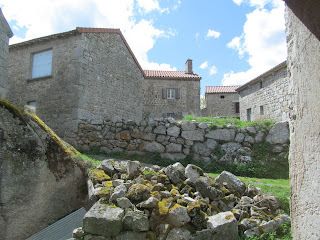 Camino to Santiago de Compostela Information and stories about the pilgrimage routes to Santiago. 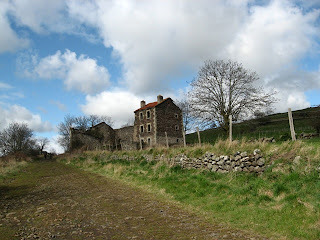 I can be a bit of a wanderer, though a homebody at present... 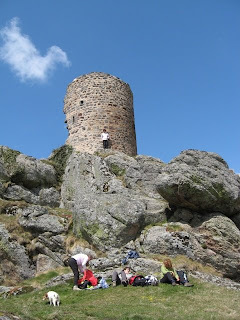 In 2008 I walked from Le-Puy-en-Velay to Santiago. 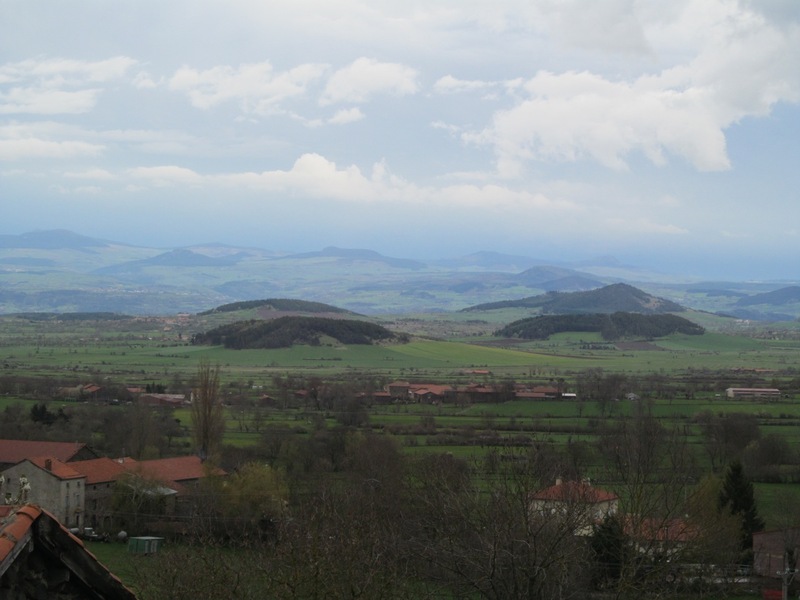 In 2012 I walked the Cluny route in France, and in 2015 I walked near Assisi for ten days. Most recently I have holidayed in Samoa, and road-tripped around the South Island.
" I don't know exactly what a prayer is. 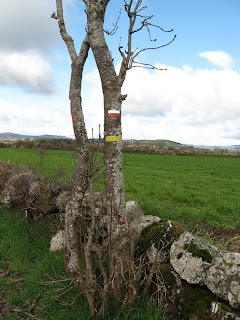 "Please know that although some people seem to imagine it as some appalling ordeal, the camino is a very health-giving thing - if you do simple things like healthy food, plenty of water, moisturise your feet and get plenty of sleep. Being out in nature for 5 weeks is just so life-giving: I finished the camino absolutely glowing with health and vitality. I hope you have a wonderful time." 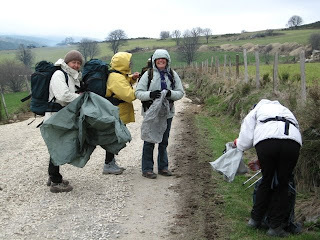 "Glowing... this is the thing about pictures of people on the Camino. 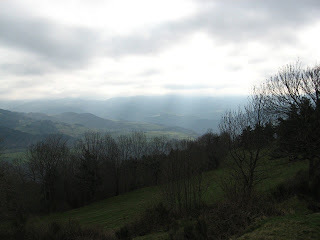 This light within... As if the Camino washed the soul and cleared the eyes."